The research team led by Yoshiki Matsuoka (Ehime University) used the Subaru Telescope to look for quasars in the distant Universe. 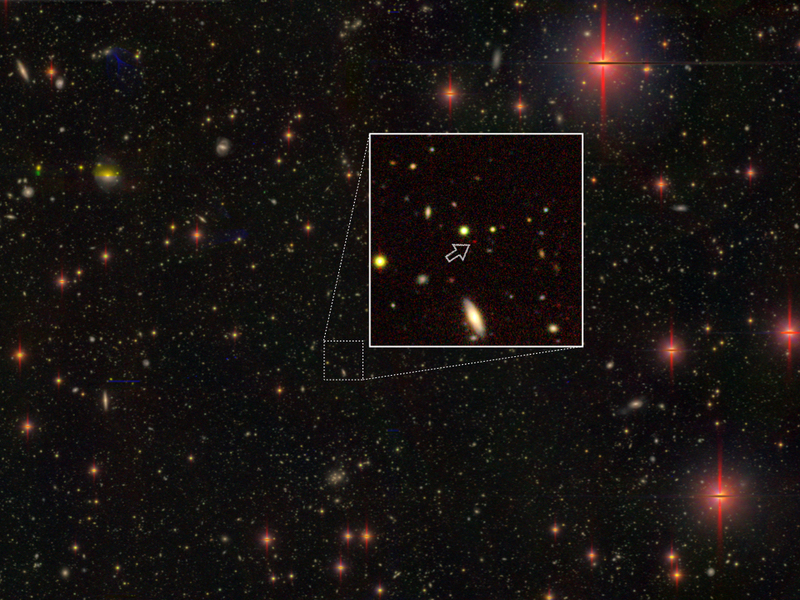 The most distant quasar discovered by the team is 13.05 billion light-years away, which is tied for the second most distant SMBH ever discovered. Because of the finite speed of light, the light emitted from these objects located 13 billion light-years away must have traveled for 13 billion years to reach us. Thus, the light provides an image of how things looked when it was emitted 13 billion years ago, when the Universe was only five percent of its current age. The survey revealed 83 previously unknown very distant quasars; together with the 17 quasars already known in the survey region. Previous studies have been sensitive only to the most luminous quasars, and thus the most massive black holes. The new discoveries probe the population of SMBH with masses characteristic of the most common ones seen in the modern Universe, and thus shed light on their origin. The survey has found that the average spacing between supermassive black holes is a billion light-years.